Embryo - TerritorioScuola Enhanced Wiki Alfa - Enhanced Search with WikiPedia Using Robots to display related resources from the web to all WikiPedia words (Video/Audio, .doc, ,pdf, .ppt, maps, edu, .html). For other uses, see Embryo (disambiguation). An embryo is an early stage of development of a multicellular diploid eukaryotic organism. In general, in organisms that reproduce sexually, an embryo develops from a zygote, the single cell resulting from the fertilization of the female egg cell by the male sperm cell. The zygote possesses half the DNA from each of its two parents. In plants, animals, and some protists, the zygote will begin to divide by mitosis to produce a multicellular organism. The result of this process is an embryo. In human pregnancy, a developing fetus is considered as an embryo until the ninth week, fertilization age, or eleventh-week gestational age. 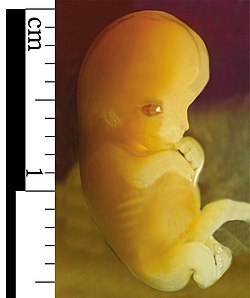 After this time the embryo is referred to as a fetus. First attested in English in the mid-14c., the word embryon derives from Medieval Latin embryo, itself from Greek ἔμβρυον (embruon), lit. "young one", which is the neuter of ἔμβρυος (embruos), lit. "growing in", from ἐν (en), "in" and βρύω (bruō), "swell, be full"; the proper Latinized form of the Greek term would be embryum. In animals, the development of the zygote into an embryo proceeds through specific recognizable stages of blastula, gastrula, and organogenesis. 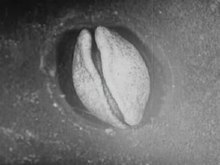 The blastula stage typically features a fluid-filled cavity, the blastocoel, surrounded by a sphere or sheet of cells, also called blastomeres. In a placental mammal, an ovum is fertilized in a fallopian tube through which it travels into the uterus. An embryo is called a fetus at a more advanced stage of development and up until birth or hatching. In humans, this is from the eleventh week of gestation. However, animals which develop in eggs outside the mother's body, are usually referred to as embryos throughout development; e.g. one would refer to a chick embryo, not a "chick fetus", even at later stages. During gastrulation the cells of the blastula undergo coordinated processes of cell division, invasion, and/or migration to form two (diploblastic) or three (triploblastic) tissue layers. In triploblastic organisms, the three germ layers are called endoderm, ectoderm, and mesoderm. The position and arrangement of the germ layers are highly species-specific, however, depending on the type of embryo produced. In vertebrates, a special population of embryonic cells called the neural crest has been proposed as a "fourth germ layer", and is thought to have been an important novelty in the evolution of head structures. During organogenesis, molecular and cellular interactions between germ layers, combined with the cells' developmental potential, or competence to respond, prompt the further differentiation of organ-specific cell types. For example, in neurogenesis, a subpopulation of ectoderm cells is set aside to become the brain, spinal cord, and peripheral nerves. Modern developmental biology is extensively probing the molecular basis for every type of organogenesis, including angiogenesis (formation of new blood vessels from pre-existing ones), chondrogenesis (cartilage), myogenesis (muscle), osteogenesis (bone), and many others. In botany, a seed plant embryo is part of a seed, consisting of precursor tissues for the leaves, stem (see hypocotyl), and root (see radicle), as well as one or more cotyledons. Once the embryo begins to germinate—grow out from the seed—it is called a seedling (plantlet). Bryophytes and ferns also produce an embryo, but do not produce seeds. 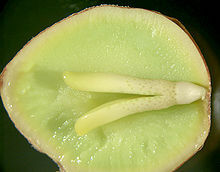 In these plants, the embryo begins its existence attached to the inside of the archegonium on a parental gametophyte from which the egg cell was generated. The inner wall of the archegonium lies in close contact with the "foot" of the developing embryo; this "foot" consists of a bulbous mass of cells at the base of the embryo which may receive nutrition from its parent gametophyte. The structure and development of the rest of the embryo varies by group of plants. As the embryo has expanded beyond the enclosing archegonium, it is no longer termed an embryo. Embryos are used in various fields of research and in techniques of assisted reproductive technology. An egg may be fertilized in vitro and the resulting embryo may be frozen for later use. The potential of embryonic stem cell research, reproductive cloning, and germline engineering are currently being explored. Prenatal diagnosis or preimplantation diagnosis enables testing embryos for diseases or conditions. Cryoconservation of animal genetic resources is a practice in which animal germplasms, such as embryos are collected and stored at low temperatures with the intent of conserving the genetic material. The embryos of Arabidopsis thaliana have been used as a model to understand gene activation, patterning, and organogenesis of seed plants. In regards to research using human embryos, the ethics and legalities of this application continue to be debated. Researchers from MERLN Institute and the Hubrecht Institute in the Netherlands managed to grow samples of synthetic rodent embryos, combining certain types of stem cells. This method will help scientists to more deeply study the very first moments of the process of the birth of a new life, which, in turn, can lead to the emergence of new effective methods to combat infertility and other genetic diseases. Fossilized animal embryos are known from the Precambrian, and are found in great numbers during the Cambrian period. Even fossilized dinosaur embryos have been discovered. Some embryos do not survive to the next stage of development. When this happens naturally, it is called spontaneous abortion or miscarriage. There are many reasons why this may occur. The most common natural cause of miscarriage is chromosomal abnormality in animals or genetic load in plants. 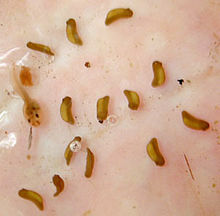 In species which produce multiple embryos at the same time, miscarriage or abortion of some embryos can provide the remaining embryos with a greater share of maternal resources. This can also disturb the pregnancy, causing harm to the second embryo. Genetic strains which miscarry their embryos are the source of commercial seedless fruits. Abortion is the process of artificially (non-naturally) removing the embryo through deliberate pharmaceutical or surgical methods. ^ "embryo". Mayo. Archived from the original on 20 February 2016. Retrieved 21 February 2016. ^ Boscá, S; Knauer, S; Laux, T (2011). "Embryonic development in Arabidopsis thaliana: from the zygote division to the shoot meristem". Frontiers in Plant Science. 2: 93. doi:10.3389/fpls.2011.00093. PMC 3355580. PMID 22639618. ^ Freedman, Jeri. "America Debates Stem Cell Research." New York, NY: The Rosen Publishing Group, 2008. ^ Sandel, Michael J. "The Case Against Perfection." Michael J. Sandel, 2007. ^ Zavos, Panayiotis. "Reproductive Cloning is Moral." Ed. James Woodward. The Ethics of Human Cloning: At Issue. Farmington Hills, MI: Greenhaven, 2005. 14–24. ^ Morelle, Rebecca. "Dinosaur embryo fossils reveal life inside the egg". BBC News. Archived from the original on 24 September 2015. Retrieved 8 August 2015. ^ Conrad Stöppler, Melissa. Shiel Jr., William C., ed. "Miscarriage (Spontaneous Abortion)". MedicineNet.com. Archived from the original on 2004-08-29. Retrieved 2009-04-07. ^ Kärkkäinen, Katri; Savolainen, Outi; Koski, Veikko (1999). "Why do plants abort so many developing seeds: bad offspring or bad maternal genotypes?". Evolutionary Ecology. 13 (3): 305–317. doi:10.1023/A:1006746900736.